The subject is four white mums in a red vase. 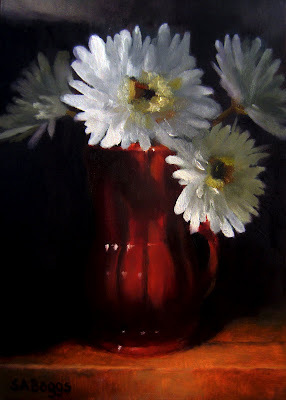 For me this painting was about the lighting on the flowers and this amazing red glazed vase that my wife has. It took a while to get this set up the way that I wanted but in the end the I loved the effect. This was a very fun painting to work on. I hope that you enjoy it.